The ability to deploy common training materials to a global workforce has brought significant advantages to organisations across the world. However, co-ordinating a training programme that is consistent, well-received, and effective across geographic borders remains a challenge for many organisations. Even the most modest e-learning initiatives can be costly and time-consuming to plan, create and deliver. It goes without saying that any project of this type should be expected to provide a positive return on investment and measurable results ‘on the ground’. Developing an e-learning programme for a global audience presents additional risks, all of which can be mitigated by working with the right localisation partner from the earliest stages of the project. It’s crucial to remember that translation is just one part of the localisation journey. Many global e-learning projects fail to live up to their promise when the constituent parts are simply viewed as ‘content’ to be translated. The increasing sophistication of e-learning assets only adds to this potential problem, as we see greater use of video, voiceover and gamification in the delivery of learning material. Elements like phone numbers, addresses, dates, and currencies will need to be converted into local formats. This aspect highlights the importance of early planning and consideration of localisation needs, as it can often be hard-coded into the e-learning platform itself rather than being dealt with at a later stage. Cultural adaptation is crucial when it comes to graphics. There can be considerable sensitivity in certain cultures to images that may be perfectly appropriate in another location. Your localisation partner will use in-country resources to ensure graphics are appropriate and resonate with the user group at which the programme is targeted. Where images contain embedded text, these will need to be translated to reflect the original message. On the subject of translation, let’s not forget that it is rarely appropriate to simply translate written content from one language to another, word for word. The art of effective translation lies in using professional translators who can communicate the underlying meaning, subtlety, and nuance of the source text in the target language. This ability and skill can dictate whether your localised e-learning programme succeeds or fails, and should not be taken lightly. 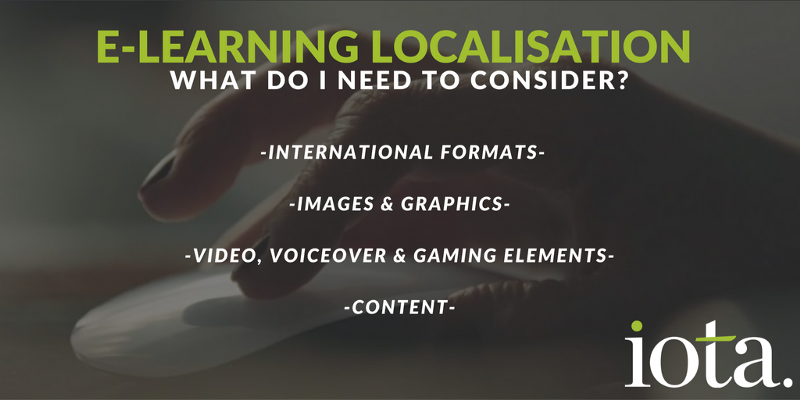 As e-learning becomes more sophisticated, so does your localisation strategy. Video resources and voice-over materials will need to be reproduced in-language. In the case of the former, subtitling can be a more cost-effective option and may be necessary where the video is not available in its original raw format. Interactive and gaming features can be addressed in many ways depending on their original format and coding. Whilst it can be simple or complicated, there is almost always a way to localise these elements effectively. None of these elements should prevent you from deploying your e-learning programme globally, but they do highlight the importance of early planning and working with an experienced localisation partner. The benefits of e-learning localisation far outweigh any risks, which is why we’ll be looking at them at them more closely in the next part of our e-learning series. In the meantime, if you’d like to talk to us about a project you’re planning — simply get in touch and we’ll be happy to help. Is bigger always better when choosing a localisation partner?